2018. All Rights Reserved. Financial Life Matters. While enjoying a complimentary dinner for two, learn about important concepts related to Retirement Income Planning and explore important considerations that can make a difference in how you spend your life in retirement. Please contact us at (785) 551-7538 for available dates and reserve your space today. Copyright 2018. All Rights Reserved. Financial Life Matters. • The content is believed to be providing accurate information. The information in this material is not intended as tax or legal advice. Please consult legal or tax professionals for specific information regarding your individual situation. The opinions expressed and material provided are for general information and should not be considered a solicitation for the purchase or sale of any security. Investment advisory services offered through Horter Investment Management, LLC, a SEC-Registered Investment Advisor. Horter Investment Management does not provide legal or tax advice. Investment Advisor Representatives of Horter Investment Management may only conduct business with residents of the states and jurisdictions in which they are properly registered or exempt from registration requirements. 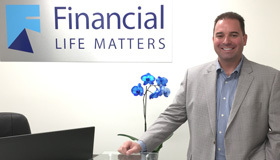 Insurance and annuity products are sold separately through Financial Life Matters, LLC. Securities transactions for Horter Investment Management clients are placed through TCA by E*TRADE, TD Ameritrade and Nationwide Advisory Solutions.